Airbnb is a service app that connects travelers and homeowners with vacant rooms together and offers various accommodation resources for the users. Its interface is clean and neat. The title in large size is also absolutely clear, and white background makes its pictures stand out and also lets us focus on the shown information, not the interface itself. And this prototype adopts a Scroll Box component to set the horizontal scrolling of pictures. The Table Bar in the bottom is also set by using an Icon and Label component. Moreover, you may also notice that there is a red dot in the upper right corner of a “PROFILE” tab. In Mockplus, you can easily select “Show Alarm” in Properties section of Icon and Label component to approach that. Of course, you can also set the number in Alarm Text to indicate the number of messages. 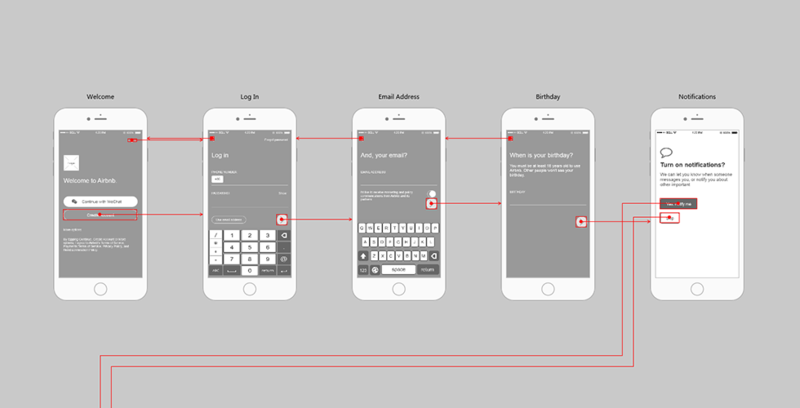 Pages of this prototype: Welcome, Log In, Home, Detail and Profile, etc. All pages of the album (12 pics in total) can be downloaded from here.